My bill, HB1360 advanced through subcommittee this week. This bill pertains to crowdfunding, which is the practice of raising small amounts of money from a large number of people, typically via the internet. It expands access to capital for entrepreneurs and small businesses, and makes it easier for Virginians to invest in Virginia businesses. Crowdfunding will become an integral part of raising capital for small businesses. I'd like to thank co-patrons, Del. Chris Head and Del. Glenn Davis for their efforts on similar bills and then joining forces to create a stronger bill. * HB1275 provides funding for a Veterans Care Center. This much-needed center will be located in Virginia Beach. * HB1630 allows the establishment of problem-solving courts as specialized court dockets within Virginia's court system. It allows judicial monitoring of intensive treatments and supervision of offenders who have special conditions and needs based on military service or mental illness. This is very important for those who have carried the weight of war on their shoulders, as they productively integrate back into society. * HB1967, a bill I submitted for the Veterans Services Foundation, provides that the foundation may accept revenue from all sources, including private-source fundraising, to support its mission. The bill also allows donors or pledgers to retain anonymity, if desired. January is National Mentoring Month. As someone whose life was changed by a mentor, I want to thank those of you who offer your time, wisdom, and attention to those who need it. I was blessed to have my "big brother" Andy Jones enter my life the day he did, and we are all blessed that he continues to serve as a mentor today. I was honored to introduce Andy and speak about Big Brothers/ Big Sisters on the House floor on Wednesday, which you can see in this video. As always, it is great to see our National Guard in Richmond. 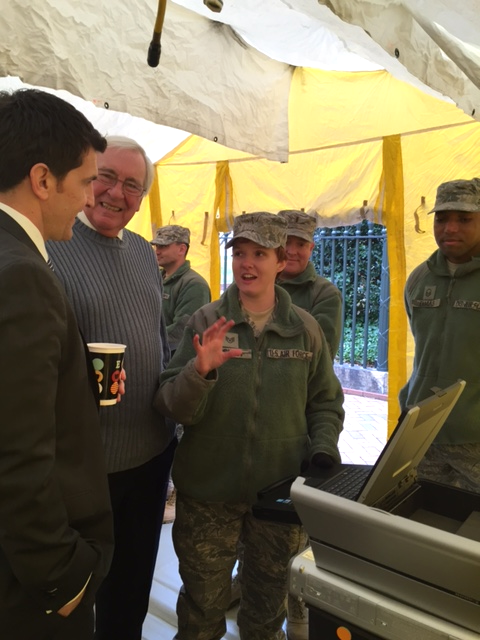 This year they provided demonstrations, which brought back memories of my service in the Navy. I'd like to thank some of the visitors we had this week for taking the time to make the trip to Richmond: Mental Health Advocates, National Federation of the Blind, Bill Curtis and Community Action Partners, Prevention Project - doing great work to stop human trafficking, NRA, Al Albowich, Virginia Accounting Association, Virginia Chamber (thanks for the award!) Virginia Breweries, including Virginia Beach's own Back Bay's Brewing Company. Please consider coming to visit. The session runs through February. If possible, please call our office to let us know to expect you!